Tag Archives for " Offsite SEO "
When people think about SEO, most immediately think of keywords on site, content and title tags. While these certainly help your site’s SEO, it is important to keep in mind that not all SEO is done on site. There are a number of things you must do outside of your website to get the best position in search engine results. Believe it or not, Google doesn’t know everything. It is, however, really efficient at collecting information from around the Internet. 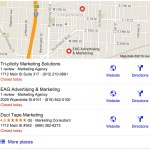 There are countless local online directories, from which Google collects its information. If the information about your business is out of date on these sites, it can affect placing on your search results pages. Manually keeping track of all of these directories can be nearly impossible, but luckily there are directory management tools available that can help you update all of the directories at once and monitor them for inconsistencies. One of our favorites at Duct Tape Marketing is Yext. Yext will also help you manage multiple locations, so your listings will always be seen by people looking for the location closest to them. Google actively rewards businesses with great online reputation. The better your online reviews on sites like Yelp, Google+ and Facebook, the better your local rankings will be. The highest rated sites are seen as more “trustworthy” by Google and therefore given better organic search positions. Finally, the more reviews you have on other third-party review sites, such as Yelp or other industry-specific sites, these sites show up higher in search results as well. What could be better than a list of great review profiles when someone searches for your business? To take advantage of this, you should keep a review profile on every available site that applies to your industry. Every local business should have a Google+ page, a Facebook business page, and a Yelp profile. Then search for something specific to add. Service providers should create at least free profiles on sites like Angie’s List for instance while doctors should be active on HealthGrades. No matter how many times Google tries to devalue backlinks, you should always be looking to secure as many links on other sites as possible. The more links you have, the more reputable your site is seen as by Google. A great way to earn more backlinks is by securing guest posts on other reputable blogs. Many blogs in many industries accept blog posts. You can use a tool like Buzzsumo to identify blogs that post from guests. You can also use Pitchbox, a tool that helps you identify and manage reaching out to many blogs at once. One great way to get backlinks is by identifying on which sites your competitors have backlinks. A tool like Ahrefs can help you find these sites. Simply enter in your competitors’ web addresses, and it will find where their site is linked. You can then enter these as opportunities in Pitchbox, and reach out to them asking for a link as well. It’s worth asking, right? One often overlooked benefit of holding active social media profiles across all available platforms is simple, you have more pages under your control that can potentially show up in searches. Keep your profiles active and under your control. You should even hold complete profiles secondary social media sites, just in case they grow and you decide to hold a bigger presence. Ideally, you want the profiles to all to have the same name or very similar names so that they are easily found. A great way to build up backlinks on these sites is to make sure each profile links back to your site. Of course, you should always promote every blog post across all platforms. These backlinks aren’t counted individually (usually, they are rated by domain) but they will make your content available to every potential audience.